Yu-Be Moisturizing Skin Cream ($16) is a soothing, healing moisturizer for dry, cracked skin and lips. This glycerin-based cream is enriched with vitamin E, vitamin B2, and camphor and helps with dry cuticles, elbows and dry patches. The strong, camphor scent is what you notice when you first open the tube. The cream itself is rather thick and pretty waxy. I have very sensitive skin so, I don't use this on my face. It is extremely concentrated so a little goes a long way when moisturizing cuticles, elbows or knees. The cream is more of a "healing ointment" so it works pretty fast to fix dry skin problems. One of my favourite ways to use this is to apply a thick layer on cracked feet and seal it with a brilliant pair of socks Yu-Be makes. It doesn't completely get rid of calluses, but seals in the moisture and helps retain it for longer. The cream does take longer than usual to sink in and feels a tad tacky, which is why I prefer to thrown in a pair of socks. It also does a fantastic job in calming down razor burns and minor rashes. Overall, the Yu-Be Moisturizing Skin Cream is a good cream for pretty much any kind of dry skin problems. For me, this is more of a quick fix cream that I reach out to when I have extreme dryness issues. If strong fragrances don't bother you so much, you can very well use this for the face too. If not, it is fast and effective to be used pretty much anywhere else on the body. 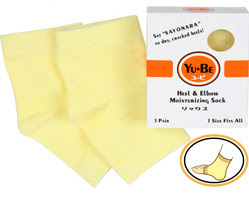 Have you tried any of Yu-Be products? It is pretty fantastic on feet!